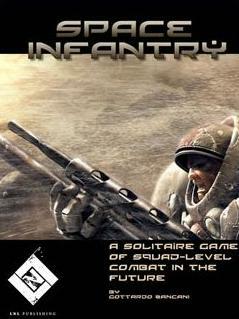 Space Infantry started as a free downloadable print-and-play game by Gottardo Zancani. Space Infantry is a solitaire sci-fi board wargame. It covers squad-level combat in the far future with players commanding a unit of 4-8 troops against various alien foes across a variety of landscapes. The free version of the game was not only fun to play but also had very high graphic art standards. Well we were not the only ones to notice how good the game was and now Lock’n Load Games has announced that they will be producing a professionally printed and boxed version of Space Infantry. If you have any interest in sci-fi games or solitaire games check this out. The game is currently on their P500 list. This entry was posted in Board Wargames, News and Updates, Sci-Fi.